Milrem Robotics is an Estonian defence solutions provider whose primary focus is the manufacture of unmanned ground vehicles, development of robotic warfare solutions and performing concept of operations and doctrine level warfare analysis. 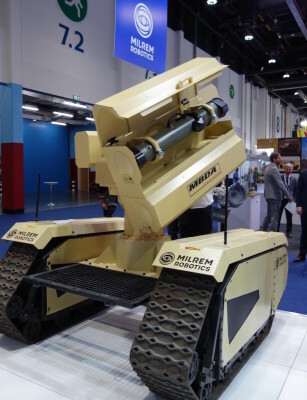 THeMIS UGV is a fully modular diesel-electric unmanned ground vehicle that can operate up to 10h with a full tank, including up to 1,5h in silent mode. It has a top speed of 22 km/h and can carry a payload of 750 kg. It can be operated line of sight, via cameras or equipped with an autonomy kit for fully autonomous operation. MMP is a latest-generation land combat missile fully adapted to modern conflict. It replaces the Milan and Javelin anti-tank missiles of the French Army and Special Forces as well as the Hot missile in use in the French cavalry units. It is a lightweight "fire-and-forget" missile with a 4km + range, featuring a state-of-the-art dual mode seeker (uncooled infrared and visible colour channels). The MMP also provides a two-way data link enabling a "man-in-the-loop" control and damage assessment through real-time video received by the gunner from the cameras fitted in the missile’s seeker. MMP operator can hence engage hidden targets or targets beyond line of sight, providing an unmatched accuracy and minimizing the risk of collateral damage. The missile's multi-purpose military charge (anti-tank, anti-personnel and anti-infrastructure) can defeat targets ranging from heavy tanks with reactive armour to infantry entrenched in an infrastructure.